In part of September & all of October of 2012, I was in Texas being trained for my job. With a free hotel, free rental car, & Dallas right next to me, I kind of had to explore this funny state. Here’s the details on a good vegan journey. For less than ten dollars, you get all you can eat. That includes items on the buffet like seaweed salad, Korean style spinach salad(with a tasty sriracha dressing), a jalapeno slaw, miso, eggplant bok choy, fried won tons, egg-less egg rolls, bean sprouts & soy beef, broccoli & soy beef in a gravy sauce, masala curry with tofu, sweet & sour soy pork, sesame soy pork, fried jalapeno potatoes, Szechuan noodles, Chinese pancakes, banana bread, and either white or brown rice. There is a lot of stuff there. 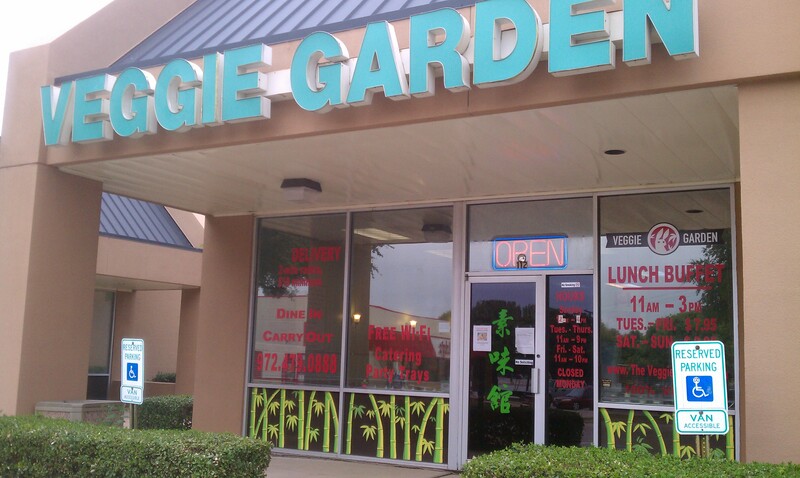 I officially love this place-the workers are so nice(the owner complimented my tattooed sleeve-I replied with a nervous, socially awkward, but happy grunt), and they are participating in the Texas State Veggie Fair, a vegan day of greatness with food vendors, speakers, cooking demos, games, prizes & music happening on the 21st this month. I’m really hoping I can take the day off of training to get there. It sounds like an awesome time! On Sunday, my church is typically vegan food. Meaning I needed to get ready. The usual coffee, shower, loose plan for the day, and I was off and running, this time initially to the Temple Shalom Food Truck Palooza. Even for getting there shortly after it began, there was quite the crowd already. That was about a fifth of how many people were really there, between the eleven food trucks, kid’s play area, table area, and the band area. 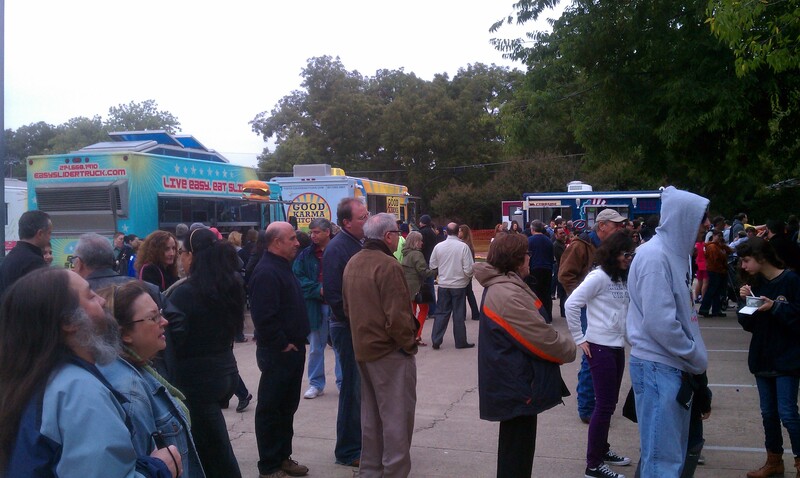 It was held on Temple Shalom’s parking lot and yard area & some of the proceeds went to the North Texas Food Bank. They had raffles and face painting, beer & wine vendors and a few bands that play throughout the day. I went just for the fun of it & to see how many vegan or partially vegan trucks there would be, plus it’s for a good cause, right? 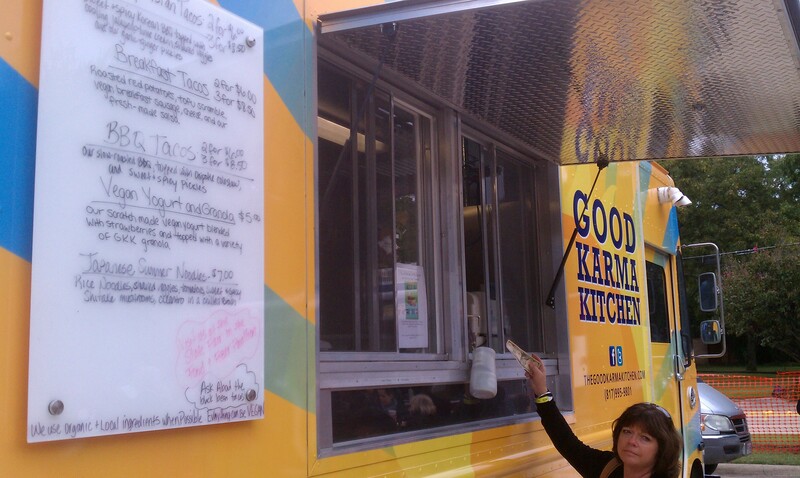 I found one truck that was vegan-Good Karma Kitchen. That lady is going to have Good Karma. I’m not sure if the lady saw the photo opportunity & thought this would look good pretending to put a large bill in the tip jar on the side of the truck, but she didn’t really tip $10. She didn’t tip at all. What was even more hilarious(to me) was that the older couple in line before me waited about 15 minutes to get to the front only to be cruelly lied to by the menu board. They wanted the $6 taco meal, and the nice lady inside asked for $6.50. The guy stepped over & looked at the board, then questioned the reasoning for the fifty cents difference. It was the tax. He grabbed his wife by the elbow and they promptly went on to a longer line at a greener, tax-free pasture(I’m pretty sure he was disappointed there too). For the record, the vegan barbeque tacos with slaw & pickle on top were delicious if he asks. I sat at the table area and got bored fast. I wasn’t in the mood to drink at that point, so no booze. I’m too big for face painting apparently, so no makeup. No bands yet, no music. None of the other trucks were remotely vegan or had any distinguishing factors indicating otherwise. I’ve come to the realization that the worse a place looks when it comes to somewhat vegan restaurants, it gets better in many cases. 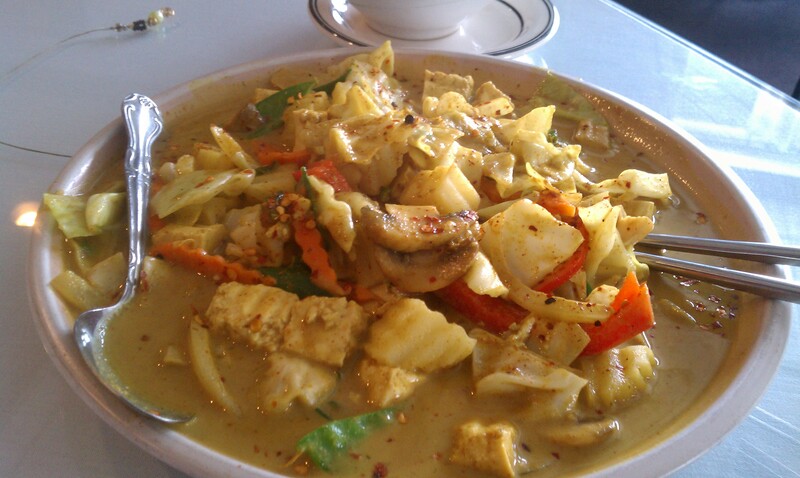 I was in the mood for some Massaman Curry, but all of the Curry dishes except for the Yellow Curry had shrimp paste in them, so Yellow it was. I made the right decision. The heat scale was 1-5. 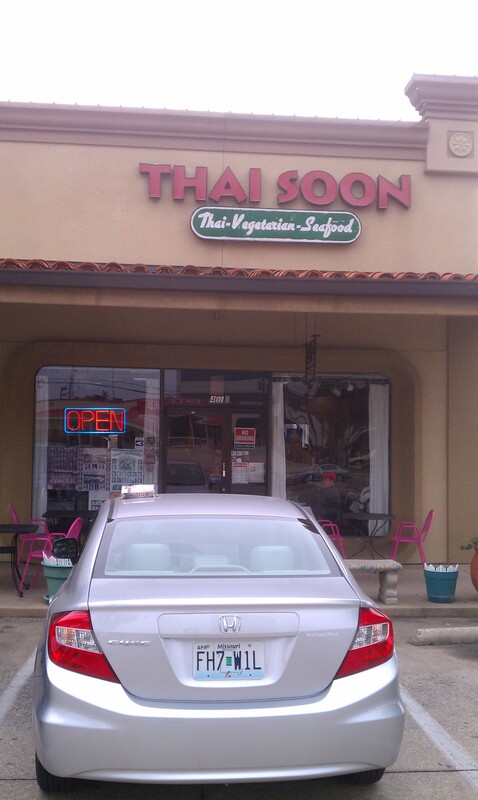 I’m used to Thai spicy(very). I picked 4 here. That was much spicier than Thai spicy. That was perfect, because I was nearing the end of “Feed” by Mira Grant(awesome novel, by the way), and my eyes were kind of tearing up anyway. This dish was awesome. Rice is right out of the picture. The sparkles are tiny flecks of goodness. It was kind of funny that I was the only person using chopsticks. Additionally, I kind of felt like a food ninja because I brought the metal chopsticks Dad gave me(Thanks again, they are getting a lot of use here). That’s just a segment of a weekend in my vegan foodie shoes. For a full look, my other blog dearthofcoffee.wordpress.com chronicles much of my other ventures out in the wild here & everywhere else. You can find all kinds of interesting things there. Can’t wait for this upcoming weekend! See you then! So I’m working in Plano, Texas for a month. Not a bad time, sans the fact it seems that I have to drive nearly four miles to get to the closest reported veg/vegan establishment. The good part is that the company I work for is picking up the bill for the hotel(plus, if I want hummus or vegan potato salad or braised beans, it is free, no matter what time–tell me that isn’t the best job ever??) & this particular hotel is located about a half mile away from both a Trader Joe’s & a Whole Foods. That makes cooking at the hotel easy. So a quick grab of some tortillas, an onion & Tofurkey brats @TJ’s and some “Vegan Cheeze” from Whole Foods(also some celebratory beer for a good job done lol) makes dinner so easy. I start with the brats. Throw them in a pan. No oil. Seriously, the oil is in the brats already. Cook on 3/4 for a few minutes, flipping every so often. After about three minutes, throw a quarter of a beer in the pan(I like IPA’s.). It might steam some, but that is good. At this point, the brats should be soft & easy to cut with the blade of the spatula. Try to cut about 1/2″ width & continue cooking until the beer is gone. Heat a large pan for 30 seconds & throw a tortilla into it. Put about a cup of Cheeze in a thin layer on it followed by a quarter of a white onion diced. Let the Cheeze somewhat melt & throw the sliced vegan brats on, wherever is good. Throw desired seasoning(I love oregano) on the full tortilla & then fold it in half. Flip it after about a minute. Probably the easiest vegan quesadilla you have ever made. Enjoy!! Postscript: if you add BBQ this becomes heaven. Also: You are probably going to get quite a few of these posts simply because I reside in a hotel until late October. My day off(yes, singular, but once more, free hummus!!) I will cover the vegan shops around the area. Let me know if you want a place checked out; I’d be more than happy to go on a daytrip endeavor!